Welcome to the ENERGY STAR Best Value Finder. Your resource for smart savings all in one place. In addition to the energy-cost savings, we'll also show you where you can find the lowest prices on ENERGY STAR certified refrigerators, TVs, and light bulbs plus utility rebates and other special offers that are now available. So click on a product and start saving now! Gearing up for warm weather? Make the cool choice with more than 20 ENERGY STAR certified room air conditioners available under $300. ENERGY STAR Best Value Finder helps keep your family cool and comfortable without breaking the bank. Is your refrigerator an energy hog? 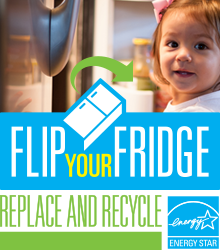 Replace your old fridge with a new model that has earned the ENERGY STAR and save $50 a year in energy bills. ENERGY STAR Best Value Finder helps you make a smart investment. How many dollars does it take to change a light bulb to ENERGY STAR? For under $5, you can choose from 35+ ENERGY STAR LED bulbs – and they can last you up to 12 years. ENERGY STAR Best Value Finder helps you start saving today. Shopping for a television with the latest features? You can find more than 0 ENERGY STAR televisions from 0+ brands under $900. ENERGY STAR Best Value Finder helps you find the energy-saving electronics you want at the best prices. Find and compare ENERGY STAR products to see how they stack up. ENERGY STAR partners sponsor rebates on certified products. Enter a zip code below to find deals near you!